The Fortnite SP-L Nerf Elite Blaster inspired by the blaster used in Fortnite, replicating the look and colours of the one from the popular video game! Play Fortnite in real life with this Nerf Elite blaster that has a detachable barrel to customize for different ways to play. Attach the barrel for distance targeting; remove the barrel when you need a more compact look for smaller play areas or when you need to move fast and stay mobile. The Fortnite SP-L blaster has an internal clip with a 3-dart capacity, so you can load 3 darts in a row before it’s time to reload. Insert 3 darts, prime, and pull the trigger to fire. It comes with 6 Official Nerf Darts that are designed for distance, tested and approved for performance and quality, and constructed of foam with flexible, hollow tips. 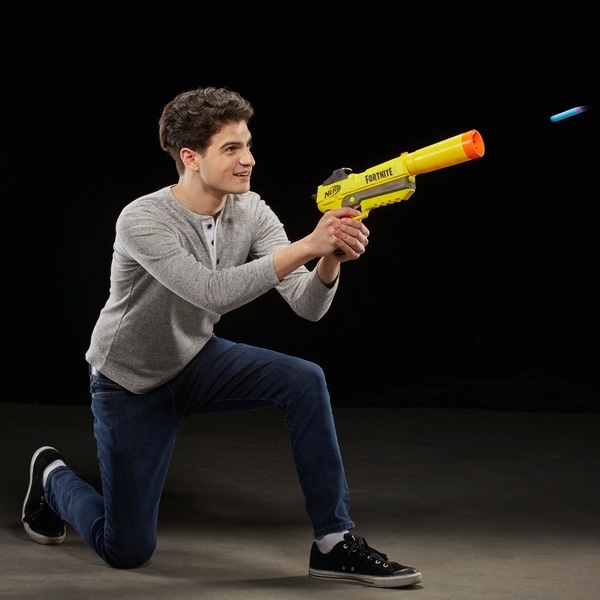 Drop into indoor and outdoor Fortnite action with this dart-firing Nerf Elite Fortnite blaster! Hand-powered -- no batteries needed.